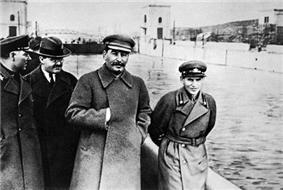 Stalinism is the means of governing and related policies implemented by Joseph Stalin. Stalinist policies in the Soviet Union included: rapid industrialization, the theory of socialism in one country, a centralized state, collectivization of agriculture, and subordination of interests of foreign communist parties to those of the Communist Party of the Soviet Union—deemed by Stalinism to be the most forefront vanguard party of communist revolution at the time. Stalinism is also commonly used in a critical manner to refer to Stalin's style of governance with associations to political repression, cult of personality, etc. This was utilized by communist parties who detracted from Stalin's policies to assert the independence of Marxism-Leninism from Stalin, with Marxism-Leninism was first described by Stalin in the Soviet Union and later copied by states based on the Soviet model (central planning, single-party state, etc. ); however Marxism-Leninism stayed after de-Stalinization, Stalinism did not. 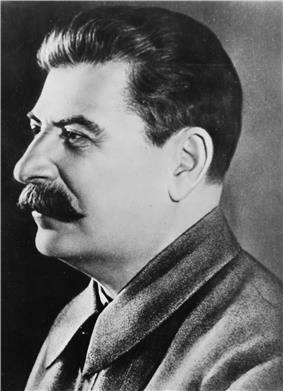 However, the term "Stalinism" is sometimes used to refer to Marxism-Leninism, sometimes to avoid implying Marxism-Leninism is related to Marxism and Leninism, as there is no definite agreement between historians of about whether Stalin actually followed the principles of Marx and Lenin. Stalinism took an aggressive stance on class conflict, utilizing state violence to forcibly purge society of the bourgeoisie, as well as the resistance of the working class. Stalin blamed the supposedly affluent farmer Kulaks as the inciters of reactionary violence against the people during the implementation of agricultural collectivisation. In response, the state under Stalin's leadership initiated a violent campaign against the Kulaks, which has been labeled as "classicide." Stalinist industrialization was officially designed to accelerate the development towards communism, stressing that such rapid industrialization was needed because the country was previously economically backward in comparison with other countries; and that it was needed in order to face the challenges posed by internal and external enemies of communism. Rapid industrialization was accompanied with mass collectivization of agriculture and rapid urbanization. Rapid urbanization converted many small villages into industrial cities. To accelerate the development of industrialization, Stalin pragmatically created joint venture contracts with major American private enterprises, such as Ford Motor Company, that under state supervision assisted in developing the basis of industry of the Soviet economy from the late 1920s to 1930s. After the American private enterprises completed their tasks, Soviet state enterprises took over. 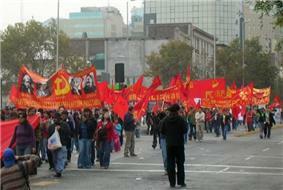 The Chilean Communist Party (Proletarian Action) during May Day demonstration in Santiago, Chile, carrying a banner with the portraits of Marx, Engels, Lenin and Stalin. The term came into prominence during the mid-1930s, when Lazar Kaganovich, a Soviet politician and associate of Stalin, reportedly declared, "Let's replace Long Live Leninism with Long Live Stalinism!" Stalin initially met this usage with hesitancy, dismissing it as excessively praiseful and contributing to a cult of personality. Stalinism is used to describe period Stalin was acting leader of the Soviet Union while serving as General Secretary of the Central Committee of the Communist Party from 1922 to his death in 1953. 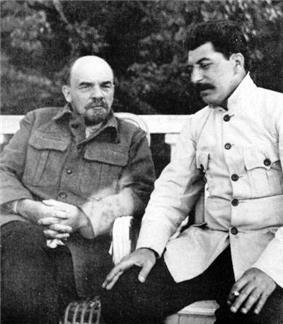 Vladimir Lenin with Stalin in the early 1920s. 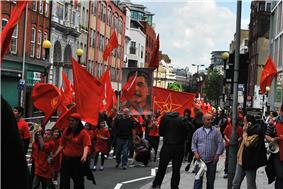 Communists in a parade in London carrying a poster of Stalin. Stalinism usually denotes a style of a government, and an ideology. 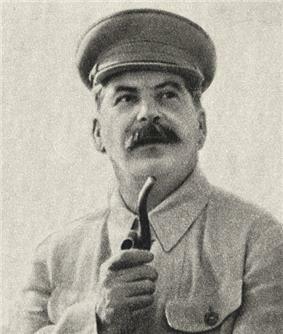 While Stalin claimed to be an adherent to the ideas of Vladimir Lenin and Karl Marx, and hence purported that his policies were merely a style of government, critics say that many of his policies and beliefs were different or in direct opposition to those of Lenin and Marx. Stalin's idea of Socialism in one country, and his turn to overt centralization were all in stark contradiction to the theories put forth by Lenin or Marx. From 1917 to 1924, Lenin, Trotsky, and Stalin often appeared united, but had had discernible ideological differences. In his dispute with Leon Trotsky, Stalin de-emphasized the role of workers in advanced capitalist countries (for example, he considered the U.S. working class as "bourgeoisified" labour aristocracy). Also, Stalin polemicized against Trotsky on the role of peasants, as in China, whereas Trotsky's position was in favor of urban insurrection over peasant-based guerrilla warfare. While traditional Communist thought holds that the state will gradually "wither away" as the implementation of socialism reduces class distinction, Stalin argued that the state must become stronger before it can wither away. In Stalin's view, counterrevolutionary elements will try to derail the transition to full Communism, and the state must be powerful enough to defeat them. For this reason, Communist regimes influenced by Stalin have been widely described as totalitarian. Soviet puppet Sheng Shicai extended Stalinist rule in Xinjiang province in the 1930s. 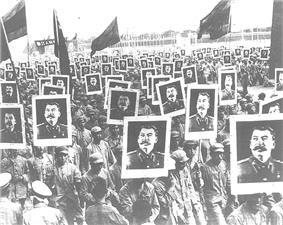 Stalin opposed the Chinese Communist Party, and Sheng conducted a purge similar to Stalin's Great Purge in 1937. Stalin, as head of the Politburo of the Central Committee of the Communist Party of the Soviet Union, consolidated near-absolute power in the 1930s with a Great Purge of the party that claimed to expel "opportunists" and "counter-revolutionary infiltrators". Those targeted by the purge were often expelled from the party, however more severe measures ranged from banishment to the Gulag labor camps to execution after trials held by NKVD troikas. Thereafter, several trials known as the Moscow Trials were held, but the procedures were replicated throughout the country. 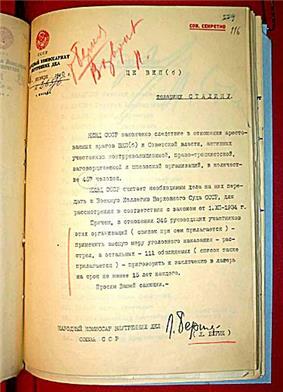 Article 58 of the legal code, which listed prohibited anti-Soviet activities as counterrevolutionary crime, was applied in the broadest manner. The flimsiest pretexts were often enough to brand someone an "enemy of the people", starting the cycle of public persecution and abuse, often proceeding to interrogation, torture and deportation, if not death. The Russian word troika gained a new meaning: a quick, simplified trial by a committee of three subordinated to NKVD -NKVD troika- with sentencing carried out within 24 hours. Stalin's hand-picked executioner, Vasili Blokhin, was entrusted with carrying out some of the high profile executions in this period. 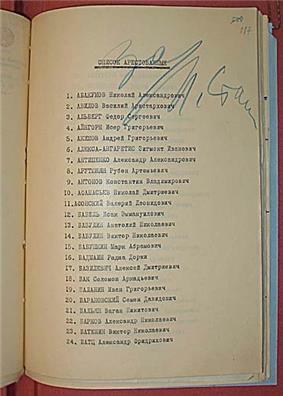 Stalin personally signed 357 proscription lists in 1937 and 1938 that condemned to execution some 40,000 people, and about 90% of these are confirmed to have been shot. At the time, while reviewing one such list, Stalin reportedly muttered to no one in particular: "Who's going to remember all this riff-raff in ten or twenty years time? No one. Who remembers the names now of the boyars Ivan the Terrible got rid of? No one." In addition, Stalin dispatched a contingent of NKVD operatives to Mongolia, established a Mongolian version of the NKVD troika, and unleashed a bloody purge in which tens of thousands were executed as "Japanese Spies." Mongolian ruler Khorloogiin Choibalsan closely followed Stalin's lead. During the 1930s and 1940s, the Soviet leadership sent NKVD squads into other countries to murder defectors and other opponents of the Soviet regime. Victims of such plots included Yevhen Konovalets, Ignace Poretsky, Rudolf Klement, Alexander Kutepov, Evgeny Miller, Leon Trotsky and the Workers' Party of Marxist Unification (POUM) leadership in Catalonia (e.g., Andreu Nin). 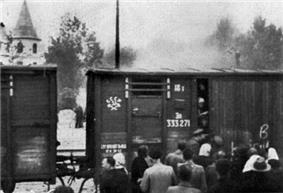 Separatism, resistance to Soviet rule and collaboration with the invading Germans were cited as the official reasons for the deportations. Individual circumstances of those spending time in German-occupied territories were not examined. After the brief Nazi occupation of the Caucasus, the entire population of five of the small highland peoples and the Crimean Tatars – more than a million people in total – were deported without notice or any opportunity to take their possessions. At the start of the 1930s Stalin launched a wave of radical economic policies, which completely overhauled the industrial and agricultural face of the Soviet Union. This came to be known as the 'Great Turn' as Russia turned away from the near-capitalist New Economic Policy. The NEP had been implemented by Lenin in order to ensure the survival of the Socialist state following seven years of war (1914–1921, World War I from 1914 to 1917, and the subsequent Civil War) and had rebuilt Soviet production to its 1913 levels. However, Russia still lagged far behind the West, and the NEP was felt by Stalin and the majority of the Communist party, not only to be compromising Communist ideals, but also not delivering sufficient economic performance, as well as not creating the envisaged Socialist society. It was therefore felt necessary to increase the pace of industrialisation in order to catch up with the West. Fredric Jameson has said that "Stalinism was [...] a success and fulfilled its historic mission, socially as well as economically" given that it "modernised the Soviet Union, transforming a peasant society into an industrial state with a literate population and a remarkable scientific superstructure." Robert Conquest disputed such a conclusion and noted that "Russia had already been fourth to fifth among industrial economies before World War I" and that Russian industrial advances could have been achieved without collectivisation, famine or terror. The industrial successes were, according to Conquest, far less than claimed, and the Soviet-style industrialisation was "an anti-innovative dead-end." 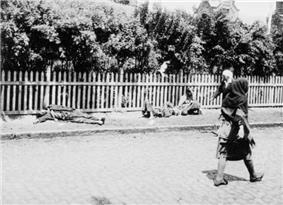 According to several Western historians, Stalinist agricultural policies were a key factor in causing the Soviet famine of 1932–1933, which the Ukrainian government now calls the Holodomor, recognizing it as an act of genocide. 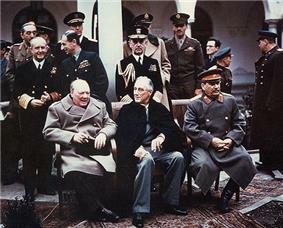 The "Big Three" Allied leaders during World War II at the Yalta Conference, British Prime Minister Winston Churchill, U.S. President Franklin D. Roosevelt and Stalin, February 1945. After Stalin's death in 1953, his successor Nikita Khrushchev repudiated his policies, condemned Stalin's cult of personality in his Secret Speech to the Twentieth Party Congress in 1956, and instituted destalinisation and relative liberalisation (within the same political framework). Consequently, some of the world's Communist parties, who previously adhered to Stalinism, abandoned it and, to a greater or lesser degree, adopted the positions of Khrushchev. The Non-Aligned Movement under the leadership of Josip Broz Tito, whom Hoxha had also denounced. The ousting of Khrushchev in 1964 by his former party-state allies has been described as a Stalinist restoration by some, epitomised by the Brezhnev Doctrine and the apparatchik/nomenklatura "stability of cadres," lasting until the period of glasnost and perestroika in the late 1980s and the fall of the Soviet Union. Aleksandr Solzhenitsyn, in writing The Mortal Danger: Misconceptions about Soviet Russia and the Threat to America, argues that the use of the term "Stalinism" is an excuse to hide the inevitable effects of communism as a whole on human liberties. He writes that the concept of Stalinism was developed after 1956 by western intellectuals so as to be able to keep alive the communist ideal. The term "Stalinism" however was in use as early as 1937 when Leon Trotsky wrote his pamphlet "Stalinism and Bolshevism". Trotskyists argue that the "Stalinist USSR" was not socialist (and not communist), but a bureaucratised degenerated workers' state — that is, a non-capitalist state in which exploitation is controlled by a ruling caste which, although not owning the means of production and not constituting a social class in its own right, accrued benefits and privileges at the expense of the working class. Some in the Third Camp use bureaucratic collectivism as a theory to critique Stalinist forms of government. Trotsky believed that the Russian revolution needed to be spread all over the globe's working class, the proletarians for world revolution; but after the failure of the revolution in Germany Stalin reasoned that industrializing and consolidating Bolshevism in Russia would best serve the proletariat in the long run. The dispute did not end until Trotsky's assassination in his Mexican villa by the communist assassin, Ramon Mercader in 1940. In the United States, Max Shachtman, at the time one of the principal Trotskyist theorists in the United States, argued that the Soviet Union had evolved from a degenerated worker's state to a new mode of production he called "bureaucratic collectivism": where orthodox Trotskyists considered the Soviet Union an ally gone astray, Shachtman and his followers argued for the formation of a Third Camp opposed equally to both the Soviet and capitalist blocs. By the mid-20th century, Shachtman many of his associates identified as social democrats rather than Trotskyists, and some ultimately abandoned socialism altogether. In the United Kingdom, Tony Cliff independently developed a critique of state capitalism that resembled Shachtman's in some respects but retained a commitment to revolutionary communism. Mao Zedong famously declared Stalin to be 70% good, 30% bad. Maoists criticis Stalin chiefly regarding his views that bourgeois influence within the Soviet Union was primarily a result of external forces (to the almost complete exclusion of internal forces) and that class contradictions ended after the basic construction of socialism. They however praise Stalin for leading the USSR and the international proletariat, defeating fascism in Germany, and his anti-revisionism. Anarchists like Emma Goldman were initially enthusiastic about the Bolsheviks, particularly after dissemination of Lenin's pamphlet State and Revolution, which painted Bolshevism in a very libertarian light. However, the relations between the anarchists and the Bolsheviks soured in Soviet Russia (e.g., in the suppression of the Kronstadt rebellion and the Makhnovist movement). Anarchists and Stalinist Communists were also in armed conflict during the Spanish civil war. Anarchists are critical of the statist, totalitarian nature of Stalinism, as well as its cult of personality around Stalin (and subsequent leaders seen by anarchists as Stalinists, such as Mao). mutual aid.". Social anarchists argue that this goal can be achieved through the decentralization of political and economic power, distributing power equally among all individuals, and finally abolishing authoritarian institutions which control certain means of production. Social anarchism rejects private property, seeing it as a source of social inequality. Social Anarchism political philosophies almost always share strong characteristics of anti-authoritarianism, anti-capitalism and anti-statism. As the Soviet Union under Stalin manifested itself as a strong centralized authoritarian state, Stalinism and libertarian socialism are almost directly opposed. In the journal Critique (Journal of Socialist Theory), Hillel H. Ticktin argues that the new Soviet rulers found themselves unable to use the market to control and exploit the peasantry and workers. So, instead, they used vast coercion, in the form of forced collectivisation, enabling them to both control the peasantry and to create an influx of new labour for rapid industrial expansion. Unprecedented levels of repression prevented any collective resistance. But, with little fear of unemployment and little monetary incentive to work harder, individual workers were still able to resist management interference. Workers also indulged in less-productive working, absenteeism and alcoholism. This Stalinist system was neither socialist nor capitalist. Neither workers nor managers really controlled the work process and this created enormous inefficiencies and waste. As long as industry kept expanding by using new labour from the countryside, these inefficiencies could be covered up. But - Ticktin says - once this labour source "dried up, as it did in the mid-1970s, the regime was doomed". Ticktin also argues that the problems of post-Soviet Russia - which are exacerbated by the continuing decline of capitalism - show that Russia is still, essentially, a "disintegrating Stalinism". The historiography of Stalin is diverse, with many different aspects of continuity and discontinuity between the regimes of Stalin and Lenin proposed. Totalitarian historians such as Richard Pipes tend to see Stalinism as the natural consequence of Leninism, that Stalin "faithfully implemented Lenin's domestic and foreign policy programmes". More nuanced versions of this general view are to be found in the works of other Western historians, such as Robert Service, who notes that "institutionally and ideologically, Lenin laid the foundations for a Stalin... but the passage from Leninism to the worse terrors of Stalinism was not smooth and inevitable." 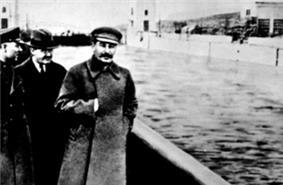 Likewise, historian Edvard Radzinsky believes that Stalin was a real follower of Lenin, exactly as he claimed himself. Opponents of this view include revisionist historians and a number of post–Cold War and otherwise dissident Soviet historians including Roy Medvedev, who argues that although "one could list the various measures carried out by Stalin that were actually a continuation of anti-democratic trends and measures implemented under Lenin... in so many ways, Stalin acted, not in line with Lenin's clear instructions, but in defiance of them". In doing so, some historians have tried to distance Stalinism from Leninism in order to undermine the Totalitarian view that the negative facets of Stalin (terror, etc.) were inherent in Communism from the start. Critics of this kind include anti-Stalinist communists such as Leon Trotsky, who pointed out that Lenin attempted to persuade the CPSU to remove Stalin from his post as its General Secretary. 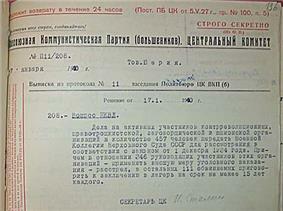 Lenin's Testament, the document which contained this order, was suppressed after Lenin's death. British historian Isaac Deutscher, in his biography of Trotsky, says that on being faced with the evidence "only the blind and the deaf could be unaware of the contrast between Stalinism and Leninism". A similar analysis is present in more recent works, such as those of Graeme Gill, who argues that "[Stalinism was] not a natural flow-on of earlier developments; [it formed a] sharp break resulting from conscious decisions by leading political actors." ^ Stephen Kotkin. Magnetic Mountain: Stalinism As a Civilization. First Paperback Edition. Berkeley and Los Angeles, California, USA: University of California Press, 1997. ISBN 9780520208230. Pp. 71, 307, 81. ^ Jeffrey Rossman. Worker Resistance Under Stalin: Class and Revolution on the Shop Floor. Harvard University Press, 2005 ISBN 0674019261. ^ Jeffrey Zuehlke. Joseph Stalin. Twenty-First Century Books, 2006. Pp. 63. ^ Jacques Semelin, Stanley (INT) Hoffman. Purify and Destroy: The Political Uses of Massacre and Genocide. New York, New York, USA: Columbia University Press, 2007. Pp. 37. ^ a b Montefiore, Simon Sebag (2004). Stalin: The Court of the Red Tsar. Knopf. p. 164. ^ a b Amadon, Phil (4 April 2011). "How Stalin Distorted Marxism". ^ Andrew D. W. Forbes (1986). Warlords and Muslims in Chinese Central Asia: a political history of Republican Sinkiang 1911-1949. Cambridge, England: CUP Archive. p. 151. ^ The exact number of negative votes is unknown. In his memoirs Anastas Mikoian writes that out of 1225 delegates, around 270 voted against Stalin and that the official number of negative votes was given as three, with the rest of ballots destroyed. Following Khrushchev's secret speech in 1956, a commission of the central committee investigated the votes and found that 267 ballots were missing. ^ McLoughlin, Barry and McDermott, Kevin, ed. (2002). Stalin's Terror: High Politics and Mass Repression in the Soviet Union. ^ Rosefielde, Stephen (1996). "Forced Labour and Economic Growth in the 1930s"Stalinism in Post-Communist Perspective: New Evidence on Killings, . Europe-Asia Studies 48 (6): 959. ^ Keep, John (1997). "Recent Writing on Stalin's Gulag: An Overview". Crime, History & Societies 1 (2): 91–112. ^ Ellman, Michael (2007). "Stalin and the Soviet Famine of 1932–33 Revisited". Europe-Asia Studies 59 (4): 663–693. ^ Ellman, Michael (2005). "The Role of Leadership Perceptions and of Intent in the Soviet Famine of 1931–1934". Europe-Asia Studies 57 (6): 826. ^ Conquest, Robert (1997). "Victims of Stalinism: A Comment". Europe-Asia Studies 49 (7): 1317–1319. ^ Dietrich Schwanitz, Bildung. Alles, was man wissen muss. "At the same time, Stalin was a kind of monstrous reincarnation of Peter the Great. Under his tyranny, Russia transformed into a country of industrial slaves, and the gigantic empire was gifted with a network of working camps, the Gulag Archipelago." ^ Fried, Richard M. (1991). Nightmare in Red: The McCarthy Era in Perspective. Oxford University Press. p. 50. ^ MacGregor Knox. Mussolini Unleashed, 1939-1941: Politics and Strategy in Italy's Last War. Pp. 63-64. ^ Leon Trotsky: Stalinism and Bolshevism (1937). Marxists.org (1937-08-28). Retrieved on 2013-07-12. ^ Faria, MA (January 8, 2012). "Stalin, Communists, and Fatal Statistics". Retrieved 5 September 2012. ^ "Mao’s Evaluations of Stalin". MassLine. Retrieved 3 August 2014. ^ Mendes, Silva. Socialismo Libertário ou Anarchismo Vol. 1 (1896): "Society should be free through mankind's spontaneous federative affiliation to life, based on the community of land and tools of the trade; meaning: Anarchy will be equality by abolition of private property and liberty by abolition of authority"
^ Hillel Ticktin, 'The Class Structure of the USSR and the Elite', Critique No.9, p56-9. ^ Hillel Ticktin, Origins of the Crisis in the USSR: Essays on the Political Economy of a Disintegrating System, 1992, p12-13, 85-6, 117, 144; Hillel Ticktin, 'Theories of Disintegration of the USSR', in Paul G. Hare (ed. ), Systemic Change in Post-Communist Economies, p158. ^ Hillel Ticktin, 'Towards a Political Economy of the USSR', Critique No.1, p27; Hillel Ticktin, 'The Political Economy of Class in the Transitional Epoch', Critique No.20-21, p16-18; Hillel Ticktin, 'Soviet Society and Professor Bettleheim', Critique No.6, p35, 43. ^ 'The Class Structure of the USSR and the Elite', Critique No.9, p61; 'Theories of Disintegration of the USSR' , p158-161. ^ Hillel Ticktin, 'Political Economy of a Disintegrating Stalinism", Critique Vol. 36, 2008. ^ "Lenin: Individual and Politics in the October Revolution". Modern History Review 2 (1): 16–19. 1990. ^ Pipes, Richard (2001). Communism: A History. pp. 73–74. ^ George Leggett, "The Cheka: Lenin's Political Police"
^ Gill, Graeme J. (1998). Stalinism. Palgrave Macmillan.